DataVault is the product of Ascendo Inc. and may be the most feature rich, multi-platform password manager you can find today. Ascendo as a company focuses primarily on BlackBerry software, but also offers DataVault for Mac, Windows, Android and iOS devices. In addition to DataVault, the company has developed five other products and has extensive experience building secure password management software. Stores information about: Credit cards, bank accounts, logins, etc. AES Encryption provides industrial strength security. 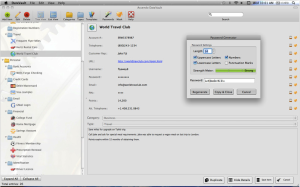 iCloud Backup to automatically save DataVault information by date. iCloud Sync to automatically update other iOS devices running DataVault. Tree & List View to display items. Support for iOS multitasking to facilitate web site login. 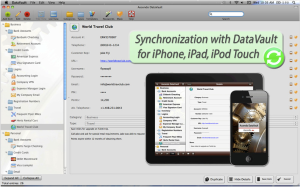 Synchronization with Data for Mac or Windows (sold separately) via Dropbox, Wi-Fi, Webdav. No other password wallet offers as many options. Conflict resolution for items that have been changed on multiple devices. Templates for common items such as bank accounts, credit cards & logins. Select from default templates or create your own. Duplicate items for faster entry. Categories & types to organize items. Password generator with user settings for length & character types. Actionable fields to initiate phone calls, emails or web site logins. Security timeout to require login after inactivity delay. Auto-Lock setting to configure login requests. Security alert for failed login attempts. Field masking to shield data from prying eyes. Email items in encrypted format. Search settings to select fields, case sensitivity. 6 themes to choose backgrounds & colors. Import data from EWallet, SplashID, mSecure, 1Password, IE, Firefox, RoboForm & others with DataVault desktops. All-in-all, DataVault offers incredibly powerful security features to protect your password data. It is hands down one of the best password managers you can get and comes to you highly recommended. If you want something more than a browser extension, go with DataVault Password Manager for Windows or Mac operating systems. You can purchase DataVault for iOS for your iPhone, or buy the iPad version here, or get both! Both can be purchased for $9.99 (iOS via iTunes; Mac OS version from the Mac App Store).